...give me the Barney Butter! I think it's a pretty safe assumption that the majority of folks in the good ol' US of A have had a Rice Krispies Treat at some point in their lives. The quality I like best about them (aside from their chewiness, sweetness, and hey--vitamin enrichment) is their versatility. There are many twists and alterations one can make to the recipe. Believe it or not, I decided to get creative. What can I say--I had a whim. I think my inspiration came from the Barney Butter I received thanks to Sandy of 4 Reluctant Entertainers. For those of you who are unfamiliar with the product, it's a completely peanut-free almond butter, which is a blessing for lovers of nut butters in this trying time of peanut butter crisis. Another contributing factor to my epiphany was the new Banana Nut Cheerios I had bought and rejected (unfortunately, they just didn't do it for me). Bearing in mind that bananas and peanut butter make a darn good combination, I decided to make my treats with those Banana Nut Cheerios, using Barney Butter in lieu of regular butter, and with freeze-dried banana dices mixed in. I was completely and wholly satisfied with my creation. There was just a hint of the almond butter, a tinge of banana, sweetness and chewiness from the marshmallows, and a fabulous crunch from the cereal. If bananas and nut butter aren't your thing, I encourage you to make up your own fantastic combination--the possibilities are endless! In a microwave-safe bowl, heat the Barney Butter and marshmallows for 1 minute; stir. Continue heating at 15 second intervals until the mixture is smooth. Dump in the cereal and banana dices and stir until well-coated. Using a buttered spatula, evenly press the mixture into a 13x9-inch pan lined with wax paper. Let cool and cut into squares. You're so creative Grace! Have you ever thought of doing a cookbook? And I don't care about the crisis. Give me my PB or give me death! Grace, this was very resourceful. The almond butter-banana combination sounds awesome! Looks like a delightful on -the-go snack. I think I'll try these this weekend. My kids will love them. I love almonds, bananas are the bomb, and Cheerios are pretty cool too! What a great creation! Can't go wrong with PB and bananas! What a nice flashback to junior high and a never ending supply of rice krispie treats! What a fun invention! Fun way to use up those Cheerios. I think my love for almonds is right up there with the cinnamon-low...complete adoration; almonds are an amazing little nut :D! Hey Grace, thanks for stopping by my blog! My kids would love these, I'll have to give it a go! Holy cow that is so cool. Nice combo with the cheerios. I recently scarfed an entire box of those banana Cheerios so I can only imagine the damage that would be done with these bars! mmmm. i love that you used the banana nut cheerios! what a great idea! have you ever done fruity pebbles? that's my favorite cereal-marshmallow combo. ohh soo sugary and good. it's a sugar coma all the way. a vitamin enriched sugar coma, of course. My kids would dig these - actually, so would I. They look fantastic Grace. i have recently discovered almond butter and love it. this looks like a totally awesome way to eat it, besides straight out of the jar. Peanut, almond, cashew, whateva' if it's got the word butter in the name I'm like a bottom feeding catfish; I'll eat it! Great spin on an old fav, clever lady! you know me, and the fact that I love to create and experi-mix with food combo's, but I never would have thought to use almond butter. how tasty! I will definitely print this baby out. Nice. Yet another blog entry making me rethink my aversion to bananas. I've really enjoyed the Banana Nut Cheerios. I usually mix in some pecan pieces and craisins to jazz 'em up a bit. Almond butter and marshmallow bars sound good. I tried some cashew butter a while ago and liked it. I will have to look for some almond butter. That Barney Butter sounds interesting! And I like how your melded the Rice Krispie with peanut butter. The idea is genius! I like this combo! Good thinking. We have been known in this house to smear peanut butter on our bananas or have banana and peanut butter sandwich. Peanut butter on nearly everything. Sounds like the perfect combination. I bet my children would so love these!! Brilliant idea! I've made "treats" using fruit loops and cocoa krispies before, but the banana nut ones sound great! Hi, Grace! I so appreciate all your encouragment. I gave you an award! You can drop by my blog to pick it up. And if I already posted this comment, I apologize. Long day! How clever! Perhaps you have invited the new American snack! These sound so good! 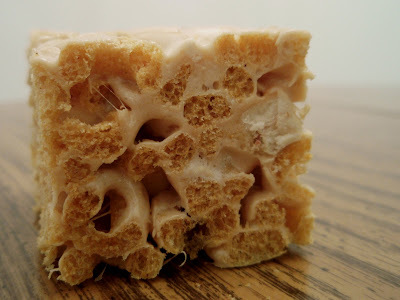 I like to change up the usual rice crispy treat and use different cereals, but this takes it even further. Great combo! Look at that cross-section pic! 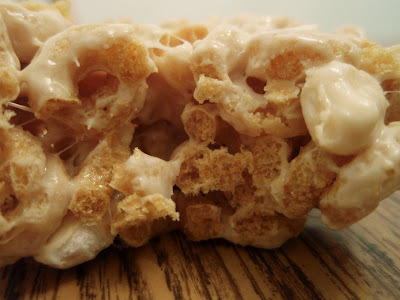 Rice Crispie squares and your creation are the sweet versions of Mac &cheese. Fabulous, I am not afraid of the peanut butter scare I am more afraid of not having my beloved peanut butter. This looks very sticky, gooey and Yum-o. Oh, yummy - I'm usually a PB fan, but man, Almond and Honey?? Sign me up! I love love love Almond Butter! I really need to try Barney Butter. These "bars" look amazing! Love your creativity! You would think that I could be more creative with it but no the craziest I've gotten is to add whole mini marshmallows and it wasn't even my idea. These look good! I have been very curious about the banana cheerios...so not good just for breakfast...but good in recipes??? Oh yummy, girl! It really is delicious, isn't it? My kids LOVE to eat a 90-calorie packet with a banana. What a dreamy treat!! Great creation! Almond butter. I'm intrigued! Fortunately your Banana Nut Bars sound like the perfect recipe to break the ice, and easy too. I'm in! I love almond butter, first starting eating this sensation about a year ago and now I am hooked. This is yet another recipe I will try with my almond butter. Thanks Grace! I've never tried almond butter yet, but this looks like a very tasty way to try it out. I'll have to give it a shot. And hey, rice krispy squares practically count as breakfast, so I'd be in the right eating it as such? Right?! I only have one comment: YUM! Peanut Butter is one of my favorite things. I figure that since I buy the all-natural Whole Foods brand, I am okay (though this is probably poor logic). I hadn't heard of Barney Butter, but I will have to check it out. Holy cow, these are treats to die for! Peanut butter makes everything better. Oh my, even a almost 44 yrs old woman will still like this delicious treat. Love that almond butter. 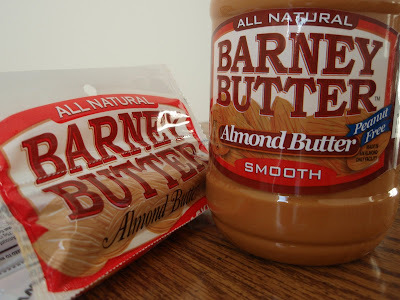 I was eyeballing the other butters at Trader Joes the other day and almost picked up a jar of almond butter. Impressive creativity you have there with these snacks. I know my son would sneak more than his share and dole them out at school. I almost bought some of those cheerios yesterday - now I'm wishing I would have so I could make these!